Among the Many Items Joining King Tut In the Afterlife ... Four Socks? Several locations around the world have claimed to have some of St. Nick’s bones, but the Catholic Church has treated the Basilica in Bari as the true keeper for quite some time. 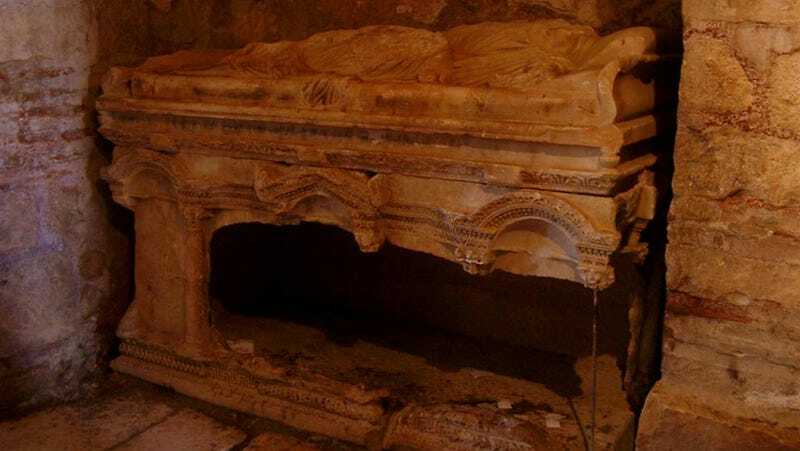 In 2013, a Turkish group went as far as to write to Pope Francis requesting that the saint’s remains be returned to their original home. While that group may have had a genuine interest in preserving the region’s history, there’s also plenty of financial motivation. St. Nick’s old hometown is firmly Muslim and doesn’t celebrate Christmas, but residents are happy to promote his origin story because it brings in tourism. “We are so happy with Saint Nicholas,” Baris Yuksel, a shopkeeper in Demre told CNN. “After lots of centuries, we are earning money thanks to Saint Nicholas.” This didn’t escape Karabayram’s attention and he told the Turkish press that if Saint Nicholas’s remains are found, it could have quite a positive impact on tourism.